The relationship between the Qur'an and science is a priori a surprise, especially when it turns out to be one of harmony and not of discord. A confrontation between a religious book and the secular ideas proclaimed by science is perhaps, in the eyes of many people today, something of a paradox. The majority of today's scientists, with a small number of exceptions of course, are indeed bound up in materialist theories, and have only indifference or contempt for religious questions which they often consider to be founded on legend. In the West moreover, when science and religion are discussed, people are quite willing to mention Judaism and Christianity among the religions referred to, but they hardly ever think of Islam. So many false judgements based on inaccurate ideas have indeed been made about it, that today it is very difficult to form an exact notion of the reality of Islam. As a prelude to any confrontation between the Islamic Revelation and science, it would seem essential that an outline be given of a religion that is so little known in the West. The totally erroneous statements made about Islam in the West are sometimes the result of ignorance, and sometimes of systematic denigration. The most serious of all the untruths told about it are however those dealing with facts; for while mistaken opinions are excusable, the presentation of facts running contrary to the reality is not. It is disturbing to read blatant untruths in eminently respectable works written by authors who a priori are highly qualified. The following is an example taken from the Universalis Encyclopedia (Encyclopedia Universalis) vol. 6. Under the heading Gospels (Evangiles) the author alludes to the differences between the latter and the Qur'an: "The evangelists (. . .) do not (. . .), as in the Qur'an, claim to transmit an autobiography that God miraculously dictated to the Prophet . . .". In fact, the Qur'an has nothing to do with an autobiography: it is a preaching; a consultation of even the worst translation would have made that clear to the author. The statement we have quoted is as far from reality as if one were to define a Gospel as an account of an evangelist's life. The person responsible for this untruth about the Qur'an is a professor at the Jesuit Faculty of Theology, Lyon ! The fact that people utter such untruths helps to give a false impression of. the Qur'an and Islam. There is hope today however because religions are no longer as inward-looking as they were and many of them are seeking for mutual understanding. One must indeed be impressed by a knowledge of the fact that an attempt is being made on the highest level of the hierarchy by Roman Catholics to establish contact with Muslims; they are trying to fight incomprehension and are doing their utmost to change the inaccurate views on Islam that are so widely held. In the Introduction to this work, I mentioned the great change that has taken place in the last few years and I quoted a document produced by the Office for Non-Christian Affairs at the Vatican under the title Orientations for a Dialogue between Christians and Muslims (Orientations pour un dialogue entre chrétiens et musulmans). It is a very important document in that it shows the new position adopted towards Islam. As we read in the third edition of this study (1970), this new position calls for 'a revision of our attitude towards it and a critical examination of our prejudices' . . . 'We should first set about progressively changing the way our Christian brothers see it. This is the most important of all.' . . . We must clear away the 'out-dated image inherited from the past, or distorted by prejudice and slander' . . . , and 'recognize the past injustice towards the Muslims for which the West, with its Christian education, is to blame.' [ At a certain period of history, hostility to Islam, in whatever shape or form, even coming from declared enemies of the church, was received with the most heartfelt approbation by high dignitaries of the Catholic Church. Thus Pope Benedict XIV, who is reputed to have been the greatest Pontiff of the Eighteenth century, unhesitatingly sent his blessing to Voltaire. This was in thanks for the dedication to him of the tragedy Mohammed or Fanaticism (Mahomet ou le Fanatisme) 1741, a coarse satire that any clever scribbler of bad faith could have written on any subject. In spite of a bad start, the play gained sufficient prestige to be included in the repertoire of the Comédie-Francaise.] The Vatican document is nearly 150 pages long. It therefore expands on the refutation of classic views held by Christians on Islam and sets out the reality. Under the title Emancipating ourselves from our worst prejudices (Nous libérer de nos préjugés les plus notables) the authors address the following suggestions to Christians: "Here also, we must surrender to a deep purification of our attitude. In particular, what is meant by this are certain 'set judgements' that are all too often and too lightly made about Islam. It is essential not to cultivate in the secret of our hearts views such as these, too easily or arbitrarily arrived at, and which the sincere Muslim finds confusing." One extremely important view of this kind is the attitude which leads people to repeatedly use the term Allah' to mean the God of the Muslims, as if the Muslims believed in a God who was different from the God of the Christians. Al lâh means 'the Divinity' in Arabic: it is a single God, implying that a correct transcription can only render the exact meaning of the word with the help of the expression 'God'. For the Muslim, al lâh is none other than the God of Moses and Jesus. "It would seem pointless to maintain that Allâh is not really God, as do certain people in the West! The conciliar documents have put the above assertion in its proper place. There is no better way of illustrating Islamic faith in God than by quoting the following extracts from Lumen Gentium [ Lumen Gentium is the title of a document produced by the Second Vatican Council (1962-1966)]. 'The Muslims profess the faith of Abraham and worship with us the sole merciful God, who is the future judge of men on the Day of Reckoning . . .'"
One can therefore understand the Muslims' protest at the all too frequent custom in European languages of saying 'Allâh' instead of 'God' . . . Cultivated Muslims have praised D. Masson's French transition of the Qur'an for having 'at last' written 'Dieu' [ God.] instead of 'Allah'. The Vatican document points out the following: "Allâh is the only word that Arabic-speaking Christians have for God." Muslims and Christians worship a single God. The Vatican document then undertakes a critical examination of the other false judgements made on Islam. The document opposes the widely-spread notion of 'Islam, religion of fear' to 'Islam, religion of love'-love of one's neighbor based on faith in God. It refutes the falsely spread notion that Muslim morality hardly exists and the other notion, shared by so many Jews and Christians, of Islamic fanaticism. It makes the following comment on this: "In fact, Islam was hardly any more fanatical during its history than the sacred bastions of Christianity whenever the Christian faith took on, as it were, a political value." At this point, the authors quote expressions from the Qur'an that show how, in the West, the expression 'Holy War' [ Translators of the Qur'an, even famous ones, have not resisted the secular habit of putting into their translations things that are not really in the Arabic text at all. One can indeed add titles to the text that are not in the original without changing the text itself, but this addition changes the general meaning. R. Blachère, for example, in his well-known translation (Pub. Maisonneuve et Larose, Paris, 1966, page 115) inserts a title that does not figure in the Qur'an: Duties of the Holy War (Obligations de la guerre sainte). This is at the beginning of a passage that is indisputably a call to arms, but does not have the character that has been ascribed to it. After reading this, how can the reader who only has access to the Qur'an via translations fail to think that a Muslim's duty is to wage holy war?] has been mis-translated; "in Arabic it is Al jihâd fî sabîl Allâh, the effort on God's road", "the effort to spread Islam and defend it against its aggressors." The Vatican document continues as follows: "The jihâd is not at all the Biblical kherem; it does not lead to extermination, but to the spreading of God's and man's rights to new lands. "-"The past violence of the jihâd generally followed the rules of war; at the time of the Crusades moreover, it was not always the Muslims that perpetrated the worst slaughters." Finally, the document deals with the prejudice according to which "Islam is a hide-bound religion which keeps its followers in a kind of superannuated Middle Ages, making them unfit to adapt to the technical conquests of the modern age." It compares analogous situations observed in Christian countries and states the following: "we find, (. ..) in the traditional expansion of Muslim thought, a principle of possible evolution in civilian society ." I am certain that this defense of Islam by the Vatican will surprise many believers today, be they Muslims, Jews or Christians. It is a demonstration of sincerity and open-mindedness that is singularly in contrast with the attitudes inherited from the past. The number of people in the West who are aware of the new attitudes adopted by the highest authorities in the Catholic Church is however very small. Once one is aware of this fact, it comes as less of a surprise to learn of the actions that sealed this reconciliation: firstly, there was the official visit made by the President of the Office for Non-Christian Affairs at the Vatican to King Faisal of Saudi Arabia; then the official reception given by Pope Paul VI to the Grand Ulema of Saudi Arabia in the course of 1974. Henceforth, one understands more clearly the spiritual significance of the fact that His Grace Bishop Elchinger received the Grand Ulema at his cathedral in Strasbourg and invited them during their visit to pray in the choir. This they did before the altar, turned towards Makka. Thus the representatives of the Muslim and Christian worlds at their highest level, who share a faith in the same God and a mutual respect for their differences of opinion, have agreed to open a dialogue. This being so, it is surely quite natural for other aspects of each respective Revelation to be confronted. The subject of this confrontation is the examination of the Scriptures in the light of scientific data and knowledge concerning the authenticity of the texts. This examination is to be undertaken for the Qur'an as it was for the Judeo-Christian Revelation. The relationship between religions and science has not always been the same in any one place or time. It is a fact that there is no writing belonging to a monotheistic religion that condemns science. In practise however, it must be admitted that scientists have had great difficulties with the religious authorities of certain creeds. For many centuries, in the Christian world, scientific development was opposed by the authorities in question, on their own initiative and without reference to the authentic Scriptures. We already know the measures taken against those who sought to enlarge science, measures which often made scientists go into exile to avoid being burnt at the stake, unless they recanted, changed their attitude and begged for pardon. The case of Galileo is always cited in this context: he was tried for having accepted the discoveries made by Copernicus on the rotation of the Earth. Galileo Was condemned as the result of a mistaken interpretation of the Bible, since not a single Scripture could reasonably be brought against him. In the case of Islam, the attitude towards science was, generally speaking, quite different. Nothing could be clearer than the famous Hadith of the Prophet: "Seek for science, even in China", or the other hadith which says that the search for knowledge is a strict duty for every Muslim man and woman. As we shall see further on in this section, another crucial fact is that the Qur'an, while inviting us to cultivate science, itself contains many observations on natural phenomena and includes explanatory details which are seen to be in total agreement with modem scientific data. There is no equal to this in the Judeo-Christian Revelation. It would nevertheless be wrong to imagine that, in the history of Islam, certain believers had never harboured a different attitude towards science. It is a fact that, at certain periods, the obligation to educate oneself and others was rather neglected. It is equally true that in the Muslim world, as elsewhere, an attempt was sometimes made to stop scientific development. All the same it will be remembered that at the height of Islam, between the Eighth and Twelfth centuries A.D., i.e. at a time when restrictions on scientific development were in force in the Christian world, a very large number of studies and discoveries were being made at Islamic universities. It was there that the remarkable cultural resources of the time were to be found. The Calif's library at Cordoba contained 400,000 volumes. Averroës was teaching there, and Greek, Indian and Persian sciences were taught. This is why scholars from all over Europe went to study at Cordoba, just as today people go to the United States to perfect their studies. A very great number of ancient manuscripts have come down to us thanks to cultivated Arabs who acted as the vehicle for the culture of conquered countries. We are also greatly indebted to Arabic culture for mathematics (algebra was an Arabic invention), astronomy, physics (optics), geology, botany, medicine (Avicenna) etc. For the very first time, science took on an international character in the Islamic universities of the Middle Ages. At this time, men were more steeped in the religious spirit than they are today. but in the Islamic world, this did not prevent them from being both believers and scientists. Science was the twin of religion and it should never have ceased to be so. The Medieval period was, for the Christian world, a time of stagnation and absolute conformity. It must be stressed that scientific research was not slowed down by the Judeo-Christian Revelation itself, but rather by those people who claimed to be its servants. Following the Renaissance, the scientists' natural reaction was to take vengeance on their former enemies; this vengeance still continues today, to such an extent indeed that in the West, anyone who talks of God in scientific circles really does stand out. This attitude affects the thinking of all young people who receive a university education, Muslims included. Their thinking could hardly be different from what it is considering the extreme positions adopted by the most eminent scientists. A Nobel prize winner for Medicine has tried in the last few years to persuade people, in a book intended for mass publication, that living matter was able to create itself by chance from several basic components. Starting, he says, with this primitive living matter, and under the influence of various external circumstances, organized living beings were formed, resulting in the formidable complex being that constitutes man. Surely these marvels of contemporary scientific knowledge in the field of life should lead a thinking person to the opposite conclusion. The organization presiding over the birth and maintenance of life surely appears more and more complicated as one studies it; the more details one knows, the more admiration it commands. A knowledge of this organization must surely lead one to consider as less and less probable the part chance has to play in the phenomenon of life. The further one advances along the road to knowledge, especially of the infinitely small, the more eloquent are the arguments in favor of the existence of a Creator. Instead of being filled with humility in the face of such facts, man is filled with arrogance. He sneers at any idea of God, in the same way he runs down anything that detracts from his pleasure and enjoyment. This is the image of the materialist society that is flourishing at present in the West. What spiritual forces can be used to oppose this pollution of thought practised by many contemporary scientists? Judaism and Christianity make no secret of their inability to cope with the tide of materialism and invasion of the West by atheism. Both of them are completely taken off guard, and from one decade to the next one can surely see how seriously diminished their resistance is to this tide that threatens to sweep everything away. The materialist atheist sees in classic Christianity nothing more than a system constructed by men over the last two thousand years designed to ensure the authority of a minority over their fellow men. He is unable to find in Judeo-Christian writings any language that is even vaguely similar to his own; they contain so many improbabilities, contradictions and incompatibilities with modern scientific data, that he refuses to take texts into consideration that the vast majority of theologians would like to see accepted as an inseparable whole. When one mentions Islam to the materialist atheist, he smiles with a complacency that is only equal to his ignorance of the subject. In common with the majority of western intellectuals, of whatever religious persuasion, he has an impressive collection of false notions about Islam. One must, on this point, allow him one or two excuses: Firstly, apart from the newly-adopted attitudes prevailing among the highest Catholic authorities, Islam has always been subject in the West to a so-called 'secular slander'. Anyone in the West who has acquired a deep knowledge of Islam knows just to what extent its history, dogma, and aims have been distorted. One must also take into account the fact that documents published in European languages on this subject (leaving aside highly specialized studies) do not make the work of a person willing to learn any easier. A knowledge of the Islamic Revelation is indeed fundamental from this point of view. Unfortunately, passages from the Qur'an, especially those relating to scientific data, are badly translated and interpreted, so that a scientist has every right to make criticisms-with apparent justification-that the Book does not actually deserve at all. This detail is worth noting henceforth: inaccuracies in translation or erroneous commentaries (the one is often associated with the other), which would not have surprised anybody one or two centuries ago, offend today's scientists. When faced with a badly translated phrase containing a scientifically unacceptable statement, the scientist is prevented from taking the phrase into serious consideration. In the chapter on human reproduction, a very typical example will be given of this kind of error. Why do such errors in translation exist? They may be explained by the fact that modern translators often take up, rather uncritically, the interpretations given by older commentators. In their day, the latter had an excuse for having given an inappropriate definition to an Arabic word containing several possible meanings; they could not possibly have understood the real sense of the word or phrase which has only become clear in the present day thanks to scientific knowledge. In other words, the problem is raised of the necessary revision of translations and commentaries. It was not possible to do this at a certain period in the past, but nowadays we have knowledge that enables us to render their true sense. These problems of translation are not present for the texts of the Judeo-Christian Revelation. the case described here is absolutely unique to the Qur'an. These scientific considerations, which are very specific to the Qur'an, greatly surprised me at first. Up until then, I had not thought it possible for one to find so many statements in a text compiled more than thirteen centuries ago referring to extremely diverse subjects and all of them totally in keeping with modern scientific knowledge. In the beginning, I had no faith whatsoever in Islam. I began this examination of the texts with a completely open mind and a total objectivity. If there was any influence acting upon me, it was gained from what I had been taught in my youth; people did not speak of Muslims, but of 'Muhammadans', to make it quite clear that what was meant was a religion founded by a man and which could not therefore have any kind of value in terms of God. Like many in the West, I could have retained the same false notions about Islam; they are so widely-spread today, that I am indeed surprised when I come across anyone, other than a specialist, who can talk in an enlightened manner on this subject. I therefore admit that before I was given a view of Islam different from the one received in the West, I was myself extremely ignorant. I owe the fact that I was able to realize the false nature of the judgements generally made in the West about Islam to exceptional circumstances. It was in Saudi Arabia itself that an inkling was given to me of the extent to which opinions held in the West on this subject are liable to error. The debt of gratitude I owe to the late King Faisal, whose memory I salute with deepest respect, is indeed very great: the fact that I was given the signal honour of hearing him speak on Islam and was able to raise with him certain problems concerning the interpretation of the Qur'an in relation to modern science is a very cherished memory. It was an extremely great privilege for me to have gathered so much precious information from him personally and those around him. Since I had now seen the wide gap separating the reality of Islam from the image we have of it in the West, I experienced a great need to learn Arabic (which I did not speak) to be sumciently well-equipped to progress in the study of such a misunderstood religion. My first goal was to read the Qur'an and to make a sentence-by-sentence analysis of it with the help of various commentaries essential to a critical study. My approach was to pay special attention to the description of numerous natural phenomena given in the Qur'an; the highly accurate nature of certain details referring to them in the Book, which was only apparent in the original, struck me by the fact that they were in keeping with present-day ideas, although a man living at the time of Muhammad could not have suspected this at all. I subsequently read several works written by Muslim authors on the scientific aspects- of the Qur'anic text: they were extremely helpful in my appreciation of it, but I have not so far discovered a general study of this subject made in the West. What initially strikes the reader confronted for the first time with a text of this kind is the sheer abundance of subjects discussed: the Creation, astronomy, the explanation of certain matters concerning the earth, and the animal and vegetable kingdoms, human reproduction. Whereas monumental errors are to be found in the Bible, I could not find a single error in the Qur'an. I had to stop and ask myself: if a man was the author of the Qur'an, how could he have written facts in the Seventh century A.D. that today are shown to be in keeping with modern scientific knowledge? There was absolutely no doubt about it: the text of the Qur'an we have today is most definitely a text of the period, if I may be allowed to put it in these terms (in the next chapter of the present section of the book I shall be dealing with this problem). What human explanation can there be for this observation? In my opinion there is no explanation; there is no special reason why an inhabitant of the Arabian Peninsula should, at a time when King Dagobert was reigning in France (629-639 A.D.), have had scientific knowledge on certain subjects that was ten centuries ahead of our own. It is an established fact that at the time of the Qur'anic Revelation, i.e. within a period of roughly twenty years straddling Hegira (622 A.D.), scientific knowledge had not progressed for centuries and the period of activity in Islamic civilization, with its accompanying scientific upsurge, came after the close of the Qur'anic Revelation. Only ignorance of such religious and secular data can lead to the following bizarre suggestion I have heard several times: if surprising statements of a scientific nature exist in the Qur'an, they may be accounted for by the fact that Arab scientists were so far ahead of their time and Muhammad was influenced by their work. Anyone who knows anything about Islamic history is aware that the period of the Middle Ages which saw the cultural and scientific upsurge in the Arab world came after Muhammad, and would not therefore indulge in such whims. Suggestions of this kind are particularly off the mark because the majority of scientific facts which are either suggested or very clearly recorded in the Qur'an have only been confirmed in modern times. It is easy to see therefore how for centuries commentators on the Qur'an (including those writing at the height of Islamic culture) have inevitably made errors of interpretation in the case of certain verses whose exact meaning could not possibly have been grasped. It was not until much later, at a period not far from our own, that it was possible to translate and interpret them correctly. This implies that a thorough linguistic knowledge is not in itself sufficient to understand these verses from the Qur'an. What is needed along with this is a highly diversified knowledge of science. A study such as the present one embraces many disciplines and is in that sense encyclopedic. As the questions raised are discussed, the variety of scientific knowledge essential to the understanding of certain verses of the Qur'an will become clear. The Qur'an does not aim at explaining certain laws governing the Universe, however; it has an absolutely basic religious objective. The descriptions of Divine Omnipotence are what principally incite man to reflect on the works of Creation. They are accompanied by references to facts accessible to human observation or to laws defined by God who presides over the organization of the universe both in the sciences of nature and as regards man. One part of these assertions is easily understood, but the meaning of the other can only be grasped if one has the essential scientific knowledge it requires. This means that in former times, man could only distinguish an apparent meaning which led him to draw the wrong conclusions on account of the inadequacy of his knowledge at the time in question. It is possible that the choice of verses from the Qur'an which are to be studied for their scientific content may perhaps seem too small for certain Muslim writers who have already drawn attention to them before I have. In general, I believe I have retained a slightly smaller number of verses than they have. On the other hand, I have singled out several verses which until now have not, in my opinion, been granted the importance they deserve from a scientific point of view. Wherever I may have mistakenly failed to take verses into consideration for this study that were selected by these writers, I hope that they will not hold it against me. I have also found, on occasion, that certain books contain scientific interpretations which do not appear to me to be correct; it is with an open mind and a clear conscience that I have provided personal interpretations of such verses. By the same token, I have tried to find references in the Qur'an to phenomena accessible to human comprehension but which have not been confirmed by modern science. In this context, I think I may have found references in the Qur'an to the presence of planets in the Universe that are similar to the Earth. It must be added that many scientists think this is a perfectly feasible fact, although modern data cannot provide any hint of certainty. I thought I owed it to myself to mention this, whilst retaining all the attendant reservations that might be applied. Had this study been made thirty years ago, it would have been necessary to add another fact predicted by the Qur'an to what would have been cited concerning astronomy , this fact is the conquest of space. At that time, subsequent to the first trials of ballistic missiles, people imagined a day when man would perhaps have the material possibility of leaving his earthly habitat and exploring space. It was then known that a verse existed in the Qur'an predicting how one day man would make this conquest. This statement has now been verified. The present confrontation between Holy Scripture and science brings ideas into play, both for the Bible and the Qur'an, which concern scientific truth. For this confrontation to be valid, the scientific arguments to be relied upon must be quite soundly established and must leave no room for doubt. Those who balk at the idea of accepting the intervention of science in an appreciation of the Scriptures deny that it is possible for science to constitute a valid term of comparison (whether it be the Bible, which does not escape the comparison unscathed-and we have seen why-or the Qur'an, which has nothing to fear from science). Science, they say, is changing with the times and a fact accepted today may be rejected later. This last comment calls for the following observation: a distinction must be drawn between scientific theory and duly controlled observed fact. Theory is intended to explain a phenomenon or a series of phenomena not readily understandable. In many instances theory changes: it is liable to be modified or replaced by another theory when scientific progress makes it easier to analyse facts and invisage a more viable explanation. On the other hand, an observed fact checked by experimentation is not liable to modification: it becomes easier to define its characteristics, but it remains the same. It has been established that the Earth revolves around the Sun and the Moon around the Earth, and this fact will not be subject to revision; all that may be done in the future is to define the orbits more clearly. A regard for the changing nature of theory is, for example, what made me reject a verse from the Qur'an thought by a Muslim physicist to predict the concept of anti-matter, a theory which is at present the subject of much debate. One can, on the other hand. quite legitimately devote great attention to a verse from the Qur'an describing the aquatic origins of life, a phenomenon we shall never be able to verify, but which has many arguments that speak in its favour. As for observed facts such as the evolution of the human embryo, it is quite possible to confront different stages described in the Qur'an with the data of modern embryology and find complete concordance between modern science and the verses of the Qur'an referring to this subject. 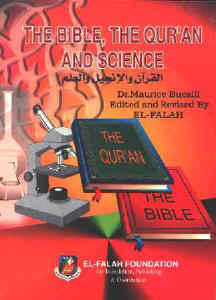 This confrontation between the Qur'an and science has been completed by two other comparisons: one is the confrontation of modern knowledge with Biblical data on the same subjects; and the other is the comparison from the same scientific point of view between the data in the Qur'an, the Book of Revelation transmitted by God to the Prophet, and the data in the Hadiths, books narrating the deeds and sayings of Muhammad that lie outside the written Revelation. At the end of this, the third section of the present work, the detailed results of the comparison between the Biblical and Qur'anic description of a single event are given, along with an account of how the passage fared when subjected to the scientific criticism of each description. An examination has, for example, been made in the case of the Creation and of the Flood. In each instance, the incompatibilities with science in the Biblical description have been made clear. Also to be seen is the complete agreement between science and the descriptions in the Qur'an referring to them. We shall note precisely those differences that make one description scientifically acceptable in the present day and the other unacceptable. This observation is of prime importance, since in the West, Jews, Christians and Atheists are unanimous in stating (without a scrap of evidence however) that Muhammad wrote the Qur'an or had it written as an imitation of the Bible. It is claimed that stories of religious history in the Qur'an resume Biblical stories. This attitude is as thoughtless as saying that Jesus Himself duped His contemporaries by drawing inspiration from the Old Testament during His preachings: the whole of Matthew's Gospel is based on this continuation of the Old Testament, as we have indeed seen already. What expert in exegesis would dream of depriving Jesus of his status as God's envoy for this reason? This is nevertheless the way that Muhammad is judged more often than not in the West: "all he did Was to copy the Bible". It is a summary judgement that does not take account of the fact that the Qur'an and the Bible provide different versions of a single event. People prefer not to talk about the difference in the descriptions. They are pronounced to be the same and thus scientific knowledge need not be brought in. We shall enlarge on these problems when dealing with the description of the Creation and the Flood. The collection of hadiths are to Muhammad what the Gospels are to Jesus: descriptions of the actions and sayings of the Prophet. Their authors were not eyewitnesses.. (This applies at least to the compilers of the collections of hadiths which are said to be the most authentic and were collected much later than the time when Muhammad was alive). They do not in any way constitute books containing the written Revelation. They are not the word of God, but the sayings of the Prophet. In these books, which are very widely read, statements are to be found containing errors from a scientific point of view, especially medical remedies. We naturally discount anything relating to problems of a religious kind, since they are not discussed here in the context of the hadiths. Many hadiths are of doubtful authenticity. they are discussed by Muslim scientists themselves. When the scientific nature of one of the hadiths is touched upon in the present work, it is essentially to put into relief all that distinguishes them from the Qur'an itself when seen from this point of view, since the latter does not contain a single scientific statement that is unacceptable. The difference, as we shall see, is quite startling. The above observation makes the hypothesis advanced by those who see Muhammad as the author of the Qur'an quite untenable. How could a man, from being illiterate, become the most important author, in terms of literary merit, in the whole of Arabic literature? How could he then pronounce truths of a scientific nature that no other human being could possibly have developed at the time, and all this without once making the slightest error in his pronouncements on the subject? The ideas in this study are developed from a purely scientific point of view. They lead to the conclusion that it is inconceivable for a human being living in the Seventh century A.D. to have made statements in the Qur'an on a great variety of subjects that do not belong to his period and for them to be in keeping with what was to be known only centuries later. For me, there can be no human explanation to the Qur'an.